Bid a forever goodbye to power cuts with the portable Generac GP5500 generator. The OHV engine of this Generac generator is designed to make it last a long time. This portable generator shuts down automatically to protect against failure due to low oil. The integrated fuel gauge of the Generac GP5500 helps you know the residual fuel so as to fill the tank up beforehand. 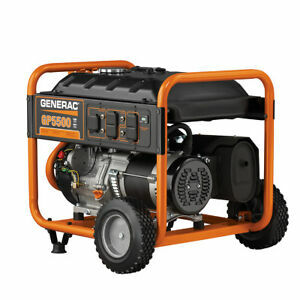 Track the maintenance of this Generac generator with its hour meter. So carry this portable generator with you and make your world light up in an instant. I've had a chance to run this unit for awhile the other day and it works great. I only connected a device that only required a small load however it seemed to work very well and I expect that it will preform as well in the future. The setup and installation were simple and all the parts were there. Followed the easy read instructions and "bingo" it was up and running. I purchased this unit after several price discount that were offered however it a good buy even at it's regular price. I DO recommend this to any of my friends. Thanks! Generator runs great. It fell of my trailer going down the road and the only thing that got hurt wad the wheels busted. Still runs awesome!